You can do that, but the place were the 4% rule really gives you protection is if you get a bad set of years early on in the sequence. Let's say the market goes up for the first three years of your retirement and you dutifully increase your spending, then down or sideways for the next ten. Now you are in the situation where your standard of living is decreasing for maybe 10 years in a row. That's a lot of belt tightening. Or you can just trust the 4% rule and everything will be fine. All true, but at some point in retirement under the 4% rule, I would think that you'd reassess your spending - be flexible in increasing (or decreasing if needed). I'd like to be in the position of someone like k9 described (ie large market returns) and have that flexibility to increase spending to splurge. The question is when and how to reevaluate spending as the retirement stash grows. It's a good "problem" to have. more likely to finish with quintuple their starting wealth than to finish with less than their starting principal! It's a spherical withdrawal rate, in a vacuum. The goal is to maximize your happiness/well being. Not to accumulate the maximum "safety" or the maximum amount of money. It's a means to an end. 4% rule is a good indication that *you won the money game, now quit*. It doesn't mean you have to quit forever, and it doesn't mean you're guaranteed a perfect life. But it does mean that continuing to work is stupid unless continuing to work is what makes you happiest. Another 4% rule article, sorta. Is all the hand-wringing over the 4% rule really about the 4% rule? Is it possible some of it is just a proxy for worrying about work stress or the fear involved in convincing yourself to trust the numbers that say you can fly if you jump off the cliff now? I think I may be guilty of it at the very least. Eh, it's because risk associated with running out of money is far more tangible than risks of overworking. People are generally speaking, very risk adverse, and most people would prefer to work a few extra years 95% of the time than worry about a 5% chance of running out of money (ignoring the dozens of ways to increase likelihood of a given withdrawal rate working). Yup....especially for those that are high earners with low spend and high savings rates, as the time value is much less. I wouldn't say "tangible". I'm definitely experiencing the risks of overworking very tangibly today. I'd say it's more the opposite (which is what you get at). Fear of the uncertain is frequently much more strongly weighed than the negatives of the known. it is like miles per gallon in a laboratory . it is a basis for comparison which rules out human interaction and spending patterns since they are so variable . .
it rules out life expectancy too as part of the equation . it simply lets you know what it what have taken to not run out of money before you ran out of time under the worst the past has thrown at us . while i retired at a 100% success rate even 90% would have been acceptable once you thrown in the odds of even living in retirement for 30 years . so how old you are when you retire is a big factor . retiring at 65 may have very small odds of needing your money to last 30 years . retiring at 55 is another story . in the real world we are delaying ss as long as we can . right now we are at about a 3.50% draw from our portfolio . at 70 the 70% larger checks will drop our draw forever down to about 2% . that is a whole lot less dependency on markets for decades . that is our main reason for delaying . we can actually spend more now early on because the higher checks later on will refill us but ss has no sequence risk . unlike our own investing which limits what we can spend because so much powder has to be kept dry for sequence risk , ss has zero sequence risk . 90% of every rolling 30 year period ended with more then you started with drawing 4% inflation adjusted . but to allow for the worst case scenario's that is about max so the end result is you usually die with to much money . if we eliminated the 5 worst time frames , 1907 , 1929,1937 ,1965/1966 the safe withdrawal rate could have actually been 6.50% . but to allow for those dates it has to drop to about 4% . the zero sequence risk of ss lets you spend that difference since sequence risk is off the table on that chunk of dough unlike if that difference had to come from our own investing . that is a major point folks miss when looking at delaying ss and the 4% swr . they get to wrapped up in what if i die , when the real issue is what if i live . I think there's also an element of "how badly do I want out?" How much risk am I willing to take to get out of this barely tolerable situation? Or, how much risk am I willing to take to do something different, when I enjoy my work for the most part and have been very successful at it? I'd also add that fear is pretty much unlimited so if you give people a reason to be worried they can generate a huge amount of angst around the topic. This gets compounded the less certainty there is in terms of the details of the situation. Peering into what will happen 2 decades into FIRE is pretty uncertain. People have been trained by society to work, value work and value themselves because of their work. Having to stop that process and break through the decades of conditioning is tough. Give them a reason to fear the outcome [however slight the risk] and it's not surprising that so many people's solution to the "problem" of the 4% SWR is to work more. In light of the last several posts, I still think an annual reassessment is probably the most reasonable way to reconcile the fear of spending too much with the probability that you're going to die with a buttload of unspent assets. If I'm 10 years into FIRE and I have a stash of 1MM, how is the modeling from that point forward any different from the modeling for a person with 1MM who is planning to FIRE at that time? Likely the only difference is that my time frame is shorter, thus I'm going to have a higher projected success rate. The fact that I've been living off of my stash for 10 years up to that point has no bearing whatsoever on my probability of success going forward. If my modeling tells me I'm not spending enough, I don't necessarily have to spend all the excess immediately. I could earmark some or all of the excess for a charitable trust or an estate for my heirs. If times get tough later on, I can raid the extra if I need to. But I also wouldn't feel too bad about using $10k on a European vacation that I wouldn't otherwise have taken if I were blindly following a set withdrawal rate that was calculated based on a smaller stash a decade ago. The point about too much belt tightening is valid, but I think most rational people would conclude that it's time for a PT job or other supplemental income source before they get too far down that road. And again, that is just as likely to happen to our FIREee who just took the plunge. The 4% rule is a good tool for determining when you're ready to take the plunge. But that doesn't mean you quit keeping track of your situation after you take the plunge. we use bob clyatts dynamic method of setting our goal posts each year . it does not mean we spend that much but we know what our limits are . it is a very easy dynamic method that has never failed out to 40 years . just take your balance each year on jan 1 and you can take 4% of that balance or if markets are down you take 5% less or 4% which ever is higher . that gives you more latitude for spending more when markets are up and mentally you will be able to do that and if down you take a 5% cut which really will not upset your lifestyle . Mathjak, what if you experience a very good year, where, say, the market goes up 20% ? I mean, you could spend the 4% of this year, but that means spending 20% more than previous year and you don't necessarily want to do that (not for the whole sum, at least). What do you do then ? Keep them in the portfolio (which is equivalent to buying expensive stocks) or transform them into cash/ST bonds (which means "I don't spend you this year, but I might need/want you in the next 2/3 years") ? because the system is dynamic and the inflation adjusting is built in spending more in up years is fine . if you don't need it then leave it allocated as you see fit . this july is our first year retired and we came in 20k under budget . so we leave it invested . our portfolio allocations have nothing to do with whether we spend or leave the money . If I'm 10 years into FIRE and I have a stash of 1MM, how is the modeling from that point forward any different from the modeling for a person with 1MM who is planning to FIRE at that time? Your right its not as long as you are still basing the analysis on 30 years and 4% of the portfolio at that time ($40k) - with that premise it is the exact same going forward as someone who FIREs now. Likely the only difference is that my time frame is shorter, thus I'm going to have a higher projected success rate. The fact that I've been living off of my stash for 10 years up to that point has no bearing whatsoever on my probability of success going forward. This is the difference - if you only are looking at the next 20 years (30-10) as there is less time needed for the portfolio to survive. Or if your initial $1mil and $40k spend has now inflated to $54k (assumes 3% inflation for 10 years) then your WR would now be 5.4% on the current $1mil portfolio, which might be fine for 20 years but what would the success factor be if applied back to 30 year period? higher valuations at retirement lead to worse market returns as opposed to lower valuations at retirement . Thanks, I always enjoy reading Kitces work. On a related note, does any one know of any articles where Kitces has talked about Safe Withdrawal Rates in the context of historical international data and not just US returns? things only have to be close math wise not event wise . mathematically a 2% real return is needed over the first 15 years of a 30 year retirement to hold up to a 4% swr . that is the common denominator to every one of the 4 worst case scenario's . the returns all fell below 1% real returns over the first 15 years but that math is only true for a 30 year retirement . I wasn't sure if Kitces had or not, or if he always relied on US results. I did know about Pfau and his less optimistic take (which is perhaps reasonable based on the data he looked at). I wanted another perspective, and I like Kitces writing: thorough and accessible, was hoping someone knew of an article from him I had missed where looks at the international data. If I had to quibble about 4% as a safe withdrawal rate, it would be that it starts to look less bullet-proof when you consider the international data. That won't make me worry or start jumping ship, we have much more flexibility built into our lives to decrease spending or make income. That's really interesting and one of the big questions I had! It would be great to be able to work out with some kind of calculator, what kind of indicators in Early FIRE that your portfolio might fail the 30yr test (or insert whatever time frame you require). What happens in the first say, 5 years of those bad scenarios? The first few years of FIRE is perhaps the best period for a FIREd person to go back to work at some level or another (as they are younger and less out of touch of their former industry). What would be a good trigger? Personally I'm thinking more and more I would be happy with a starting Portfolio at FIRE that has an ~80% chance of success. I'd FIRE at a much lower value, eg down to 50%, if I had a good handle on potential trigger conditions of a bad scenario in the first ~5 years and could thus more aggresively implement moustachian protections (eg spending a few months here and there on contract work to ride out a period). I reckon if someone could come up with a Post FIRE Calculator to help people work this out, then a lot of people would be more comfortable with going FIRE with a higher initial WR. the best look at this in my opinion is when michael kitces actually broke it out for us . I actually read a bunch of Kitces' articles right after I wrote that post, he has some really useful analyses with regard to SWRs and early trigger conditions! Its worth reading through the whole article (don't stop after the first couple of graphs...there is more to the story). You can see that the best correlations with real returns (ignore nominal returns as he explains prior to that graph) is around the 8-10 year mark. However, you probably don't want to wait until the 8 year mark to make changes, if you happen to be in one of those bad runs! Otherwise you would have missed 7 years of correctional opportunity and it might be too late to really do anything about it (or at least, harder)! Clearly, first year of FIRE, there is little correlation, so its worth just ignoring a bad real returns year then. Though the correlation gets much stronger in the second and subsequent years. Kitces talks in many places (inc on that article) about how a diversified portfolio (he mainly keeps it simple with bonds/shares) helps to get a portfolio through these bad periods, particularly the first couple of years. I'm betting that, as well as having a well diversified portfolio (with international sharemarket diversification in different ETFs), if you just threw in a year of no withdrawals somewhere in the first few years, you would significantly reduce the chance of portfolio failure, at any WR above 4%. A "no withdrawal" year doesn't mean going back to work full time, it could just mean some part time work combined with some other moustachian way of reducing spending (eg maybe its working for an aid agency somewhere for a year on low pay). Essentially, having a no withdrawal year, would be akin to adding another factor of diversification to your portfolio. It would be interesting to see the effect on SWRs, if a "non withdrawal year" is added somewhere in the first ten-fifteen years of draw down. Or 1.5 years, or two years. Given the many, many moustachian ways of doing such a period, its not outside the realms of FIRE possibility for most people on MMM. The main way I can think of analysing this is by going through a TON of simulations on cfiresim or Firecalc. But there is probably a smarter way to model it by using a script. If going the cfiresim/firecalc route, you would have to do runs for different lengths of fire (I would suggest 30, 40, 50 years...being thus realistic for early FIRErs), various withdrawal rates (eg 4, 4.5, 5, 5.5,.....9%), and then insert a year of zero spending (probably by adding a years income) in each year from 1 up to R where R = years of retirement. It could then all be repeated again with a second and third year of zero spending (but using all possible combos, eg, your zero spending could be consecutive ie FIRE years 3,4,5, or non, eg years 1,4,6)...and it could be repeated with some different portfolio allocations (to the limits of what those two tools provide...). (As you can see that's a lot of simulations, really, would be easier with a script). in practice we tend to automatically kind of adjust when things are not going well . i think we all pretty much have a hard time doing any extra spending when markets are not doing well . i know the last two years have not been great since i retired and even though the budget says we can , we did not do as many trips as we planned . we just naturally tend to cut back or spend more in real life based on how we feel mentally . we actually came in 20k less than what we allocated for the year , since aug 1 is an anniversary . Yeah, I'm a long time pre FIRE but I could imagine myself cutting back whenever the market isn't doing so well...if I'm not prior armed with appropriate knowledge to allay my fears. After I posted last night I did some quick playing around in cfiresim with what I expect will be roughly my target portfolio of 80% equities, 15% bonds, 5% Gold. Results are interesting. With including some years in the first ten that are no withdrawal. Interestingly it seems that replacing the 5% gold with an extra 5% bonds is a bad idea in all those scenarios I tested, reduces success a few percent. That bit of extra diversification and inflation protection that a small bit of Gold provides is worth it in the historical worst case scenarios. Given that 5% gold is not massive (not like what's suggested in say the permanent portfolio) I think its worth it. Interestingly, at least with my AA, having a no withdrawal year in the first year has less effect than ones in years 2-10 of FIRE. This goes along with what Kitces says. For me the difference was only slight (about 1% success), probably because as well as bonds I have gold in there. It would be more pronounced if you only had one equity ETF and one bonds ETF. The data in cfiresim doesn't give you the options we have today of investing one's equities in a very diverse range of different markets that aren't highly correlated. Doing this might help increase SWR a little more. I think I'll carefully run a load of scenarios in cfiresim like this and start recording the results to plot. I think this kind of way of looking at things is very useful for people on this forum who are quite Moustachian in outlook; so many on here either do or plan to do significant things in FIRE that would result in reducing their WR for various years (eg working as a low paid tour guide somewhere, working in an orphanage, spending a year overseas with the Red Cross, etc), thus potentially increasing their SWR dramatically. be careful testing for a safe withdrawal rate with gold . 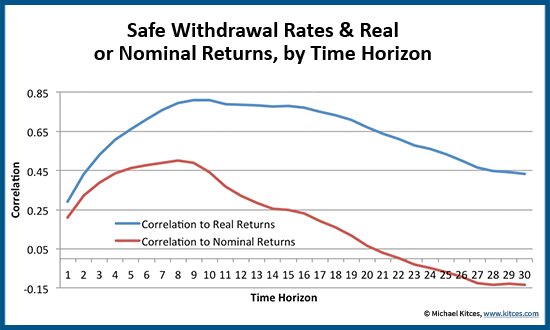 by definition a safe withdrawal rate means the portfolio was stress tested over very specific worst case time frames . they are 1907 in some cases , 1929,1937,1965/1966 . gold was not freely traded here in the usa and not a main stream investment until 1975 . then it had certain once in a life time events have it soaring . we have no idea what gold would have done under those time frames or different conditions for itself . so we can not accurately compare what if's to any of the time frames that the 4% safe withdrawal rate is based on . any other time frames you pick to use may be bad but they are not the worst case scenario's the so called "rule" is based on . 1oz of gold in 1975 was 175.00 bucks . if you put the same 175 bucks in to a 1 month t-bill and rolled it over up until today the t-bill beat it by a few dollars . equity's and bonds beat it many times over . it always came to pass that no matter what the situation we had in time that was supposedly good for gold , longer term everything else ended up doing better . this reply has a great illustration of why gold back-tests well. I think the key point on Gold is that getting robust data isn't easy. tylers data on gold and assumptions are just that . assumptions and what if's . we do not know what golds outcome would have been if it were freely traded here . there is no data on gold in the pre 1975 years since except for collectible coins gold was not legal to own . it also had once in a lifetime events applied to the price at the same time as it was taken off the standard . .
you cannot use the years the safe withdrawal rates are stressed tested against . while index's and stocks change constantly and nothing is as it was , the fact is gold here was not a viable asset class for the most part until after 1975 and to try to predict what might have been is silly . you can't even guess at it from what silver did . look at 2008 when gold went up while silver plunged . .
Also interested in that scenario; what performs well in a credit bubble crash? What about a Real Estate bubble crash (obviously not REITs, haha). I guess the idea with gold is its a potential help in high inflation or negative real interest scenarios. If you don't ever experience one of those, then its a waste compared to most other things, of course. 1965/ 1966 as a starting point was not bad for stocks over that 30 year time frame at all. in fact they saw a 10.23% average return . , it was inflation that did them in . inflation soared in the first few years from 1% to double digits . in every failure it was the first 15 years out of 30 that caused the failure . this is the first 15 years . Many of the concerns around the years covered by the SWR calculators are discussed in the FAQ. My bad -- I deleted the original post in favor of the simple link (I chose to add a new topic to the FAQ instead) before I saw that you replied. You're too quick. ;) I understand your concern with the coverage of the data and appreciate your preference for other studies. It's why I pointed to the FAQ that covers these things in detail. BTW, I see that you're fond of Kitces' article on the importance of the first 15 years of real returns in retirement (as am I -- it's a good one). Even if the SWR calculator isn't your favorite, perhaps you'll find this one interesting: https://portfoliocharts.com/portfolio/rolling-returns/ It doesn't cover every 15-year period in history (I wish it could! ), but it's a decent way to evaluate which portfolios have been most consistent over that length of time. What do you mean by a "credit bubble"? yep , there has not been one single worst case scenario that didn't have the failure happen because of the first 15 years . think about it , the 1965/1966 group were part of the 1982 greatest bull market in history . but even that could not help them . great gains on to little money is to little to late when things get spent down to far early on . it isn't just about the money lasting x-amount of years as well , it is about the balance left at the end . portfolio's can show they passed fine but live 1 more year and you are broke . if it wasn't for 1907,1929,1937 and 1965/1966 the safe withdrawal rate for a 60/40 mix would be 6.50% . so if stress testing without those years your results being compared would be quite different and not apples to apples . anytime gold is in the mix you really can not predict what those years would have been like had it actually traded here freely . the once in lifetime event of coming off the gold standard would certainly skew things earlier as well , showing performance that likely was a pricing error like nasdaq at 5000 or real estate was getting before the plunge in many areas . Most of his points will be easily turned aside. He does talk about his own expense inflation, a very real risk for very early retirees on bare-bones budgets. That article is based on fairly rubbish assumptions. No expense multiplier is going to be enough if you consistently increase your spending to keep up with the Jones's and buy everything new under the sun. Yes. Insecurity, fear and retail therapy all add up to many years of extra work in your life. You really have to ask yourself "Is it worth it?" I'm buying small and mid cap stocks that have very little debt on their balance sheet. I'm also only long on one (non employer) Bank stock. I'm also not sure what "credit bubble" means and I'm in banking. I'm assuming we're talking about how companies will see their interest expense double with small interest rate movements, thus shrinking earnings or causing defaults. Most of his points will be easily turned aside.